I know I'm a Marvel pessimist but the sight of Goop's name on the poster and no trace of Pfeiffer anywhere steams me. Marvel owes her a major scene in this one after what they did - or didn't do - with her in Ant Man 2. I'm craving a Marvel "Revenge Of The Underused Talented Actresses" franchise. Paging Michelle Pfeiffer, Rachel McAdams and Annette Bening, among others. I have yet to see Captain Marvel but it sounds like Bening has more to do than Pfeiffer did in ANT-MAN 2. I think Glenn Close is the one who got screwed the most by Marvel, they always tout how they cast these elite older actresses but they gave Close such a small part and then they cut her from the sequel, Lol. Hell, I didn't even know Close was in a Marvel film, which tells you how little I care about this genre. I will say that I understand what a huge financial boon these comic book / superhero films have been to the movie business. I get that. But they're wasting great acting talent. There should be a way to give these talented actresses more to do without alienating their fanboy audience. You would think so, anyway. Well, as the biggest MCU optimist on here, I know the folks at Marvel promised more for Janet, which most likely means Ant-Man 3 is a go as well. Though while I know how particular THAT scene needed to be, I would have loved it if Janet wasn't snapped and she'd be among those fighting back in Endgame so Michelle could have a bigger role. But it still lifts my fanboy heart to know that the finale of the biggest franchise of the past decade has her involved in it. Plus, they may not be the meaty roles we've been hoping for, but Endgame and Maleficent makes it 2 for Michelle this year. Not bad for an older actress starting a cosmetics line from the ground up. Bening has a pretty sizeable role. Agreed with Close though. Her return was actually something I was looking forward to for the Guardians sequel, and then...pbbt. I hope they can rectify this, especially considering that older actresses Blanchett and Basset were utilised pretty well, as well as Alfre Woodard and Ming-Na Wen over in the TV shows. I haven't seen anything about a possible third Ant-Man lately, I think Marvel is on Phase 4, right? And it looks pretty stacked already with Black Panther 2, Spider-Man, etc. I have seen some people speculate that there will be an Avengers 5, but I don't really see how. Nothing has been officially announced beyond Spider-Man: Far From Home. I imagine this Summer/Fall, MARVEL will announce it's next slate of movies (and will apparently be dropping the term 'phase' as well). I can see them doing ANT-MAN 3 with a reduced budget, different locale and a significant Marvel character to heighten appeal. Although, I can't imagine it's at the top of anyones list, especially with Peyton Reed expressing interest in doing a FANTASTIC FOUR movie. There is still very little given away in the new trailer and the film is meant to be about 3hrs long. I am prepared though to get about 5-10mins of Janet Van Dyne screen time. But...I think that's what we're going to get, Lol. Or maybe that and another short scene to explain the time vortex? Like I said to you, I just don't believe this, because as you said, Pfeiffer was dusted like the others and we are supposed to believe they will just forget that and leave her out? Not buying it. I really think Janet and the Quantum Realm plays a huge role in it. Not saying she has loads of screentime, but I'm sure she'll have a key expository scene or something. 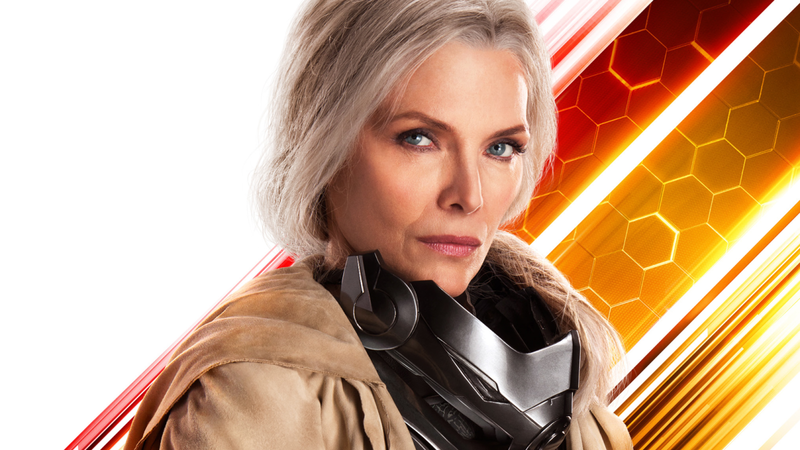 I'm sure Michelle will be in Avengers Endgame. When is everyone planning on seeing this anyway? Don't think ill be able to see till the Monday 29th so I will have to try and avoid spoilers all that weekend. I'm waiting for my press screening invite. Think I read the Premiere is 22nd April. Hope Michelle is there.